Our process turns glass bottles and jars into product for re-melt. A special feature of our Materials Recycling Facility in Derbyshire is the advanced process for sorting glass. The glass sorting technology is the result of significant investment and development by HW Martin Waste Ltd and is almost unique in the UK. Glass bottles and jars in mixed recyclable materials are extracted and processed through several stages to clean and grade the material. The resulting products use two size grades of glass cullet, which is used by glass re-processors to make new products, including glass bottles – “closed-loop recycling”. 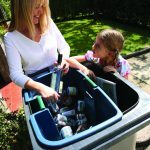 To enquire about our recycling capability email recycling@hwmartin.com.